The Renaissance era is a wonderful period in our history, featuring great advancements in science, art, literature, and culture. It is no wonder that people in modern times are still fascinated with this unique time period. One of our favorite kinds of email we receive is from parents describing how thrilled they are that their children have developed an interest in learning more about the Renaissance period. The world of the Renaissance is fascinating for both children and adults, and if you have children who grow to have an interest in the time period, you will be just as happy to learn more as they will! While boys tend to gravitate towards the rough and tumble world of literary swordfights and other lurid details of the Renaissance, girls become enamored with royalty…and with good reason! The legends surrounding Renaissance royalty, and even the facts, are just as incredible as anything your imagination can conjure. The history of the Renaissance era is full of stories of pomp and circumstance, of kings and queens and, of course, beautiful princesses. It is every young girl’s dream to become a princess, and, with the help of Pearson’s Renaissance Shoppe, your daughter can wear period-accurate Renaissance crowns! Royalty in the Renaissance period were known for their ostentatious fashion. As the concept of “high fashion” began to flourish, jewelry became more and more bedazzled. The desire for eye-catching jewelry, coupled with the advancements made in metalworking, lead to fantastic Renaissance crowns. If your daughter has the same eye for shimmering jewelry, take a look at our Aurora’s Tiara Princess Crown. 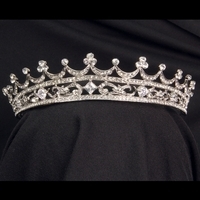 This crown sparkles with crystals and detailed filigree. Not all girls are predisposed to a fascination with the high society glamor of royalty – many girls spend their time outside climbing trees and enjoying the simple pleasures of nature. In cases such as these, your daughter might be interested in the Alchemist’s Daughter Headpiece. This unique headpiece isn’t a traditional crown, but with it comes its own form of nobility. Every young girl is different, and if she becomes interested in the Renaissance era, the options for her are limitless. That is the magic of the Renaissance era: it was a time when many different influences and backgrounds forged together to create new and exciting ideas and fashions. Visit Pearson’s Renaissance Shoppe to see our complete selection of Renaissance crowns today!